Why Santa is Getting Coals for Christmas! This is a reprinted post from 2009… but oh so fun when reminding genealogy researchers to review Criminal Records and Conduct Registers when tracing ancestors. The following examples were all taken from ancestry.com (a quick search on the name Santa Claus). You know you too are curious of what ‘ole Santa was doing in the 1880’s. 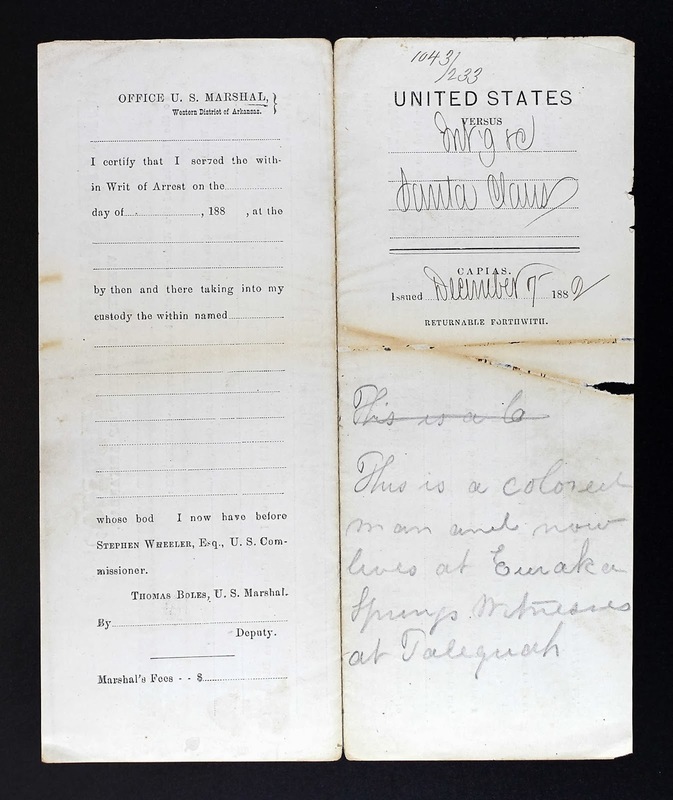 On the 15 Aug 1881, the U. S. District Court, Western District of Arkansas was none too happy with Santa Claus. Was he really selling “spirit?” Perhaps it was a tough year, and he needed help spreading the Season’s Joy. Well this “colored” Santa, lived in Eureka Springs close to the Tahlequah (Indian Reservation), was accused of“introduc[ing] into the Indian country a large quantity of spirituous liquors…two gallons of whisky[sic]”. By doing so, he violated the IRS laws by not paying the special liquor law tax. 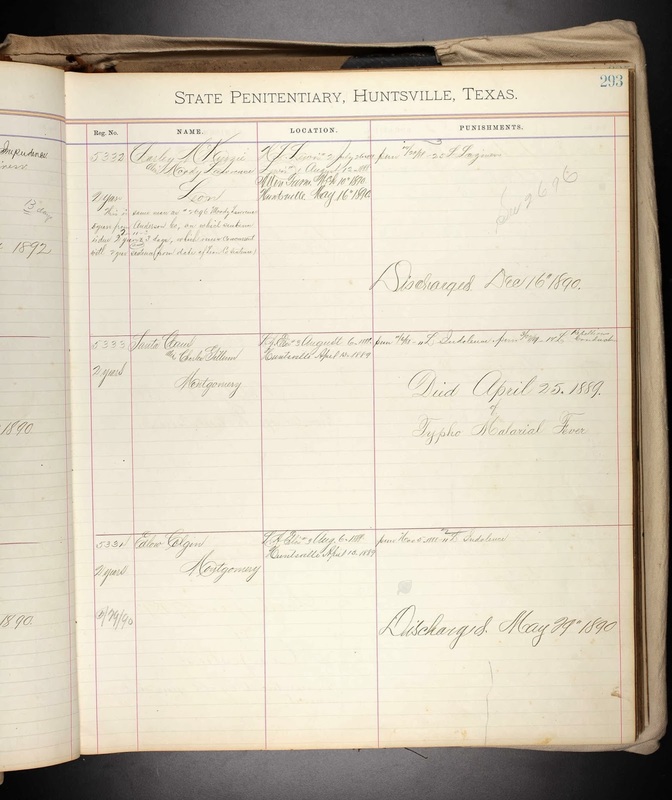 In November of 1888, Santa Claus from Texas, was serving time in the State Penitentiary in Huntsville. He had to serve two years for rebellious conduct. He unfortunately didn’t complete his time, as he died 25 April 1889. Hmm...no one said Santa was immortal! It Might Be Legal In Some Places, but…. At a3Genealogy we aren’t sure if Santa isn’t being mistreated…a bit. In Minnesota, women can face up to 30 days in jail for impersonating Santa Claus…it was on the books as late as 2012. Wondering if that has changed this past year! Merry Christmas from the a3Genealogy Staff and Researchers! Deadline - 22 Dec 2013, 5:00p.m. One lucky follower will win a 23andMe DNA kit ($99.00 value). Putting health/medical issues aside, this DNA kit is a wonderful tool to aid in determining family and kinship. This autosomal test assists in genealogical research and bringing down research in your brickwalls. For information on this type of DNA testing, review Your DNA Results. Visit the 23andMe site to learn more on the product. 4) Share a3Genealogy with Friends (this one won't be tracked, but appreciated). Your name will be entered into a drawing. (Must meet all requirements by 5:00pm Dec 22). Winner will be confirmed Dec 23rd. Just in time for the holidays. For the true Genealogists in you, I know you have at least been wondering where would a country like South Africa turn to for an account of its history? The answer…depends on your ancestral heritage. It should surprise no one that there is a 1) Genealogical Society of South Africa. Yes, you will find information on gravestones, a collection of 2) Family Bibles with genealogical information, and early 3) Church Registers and Baptisms (1745 - 1912). Like FindaGrave.com and BillionGraves.com, you will be pleased to know volunteers have added over a half a million gravestone photos to the 4) Gravestones in South Africa project. 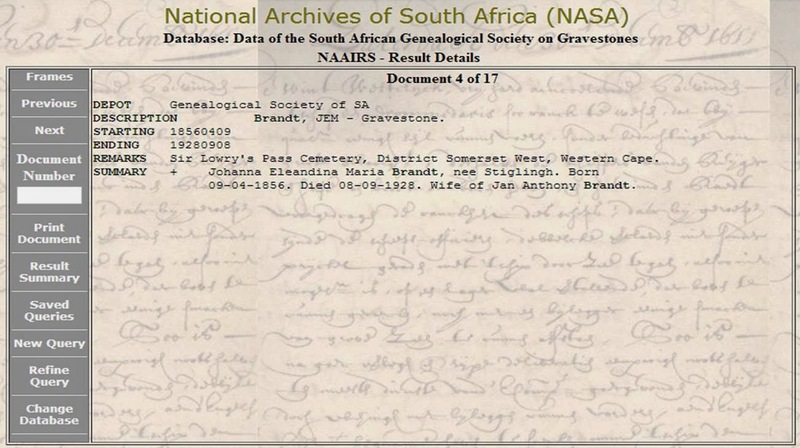 Researchers of historical topics of South Africa will find an impressive collection also at the 5) National Archives of South Africa (NASA) website, which provides searchable finding aids for various topics. Here are a few of the databases of interest. What about the Slave History? Slavery existed in South Africa from 1653, Cape Town, until 1834 when it was abolished. (Yes, before the USA - it was under the British Empire nonetheless). This only granted ex slaves a life of forced indentured servants under their former slave owners. 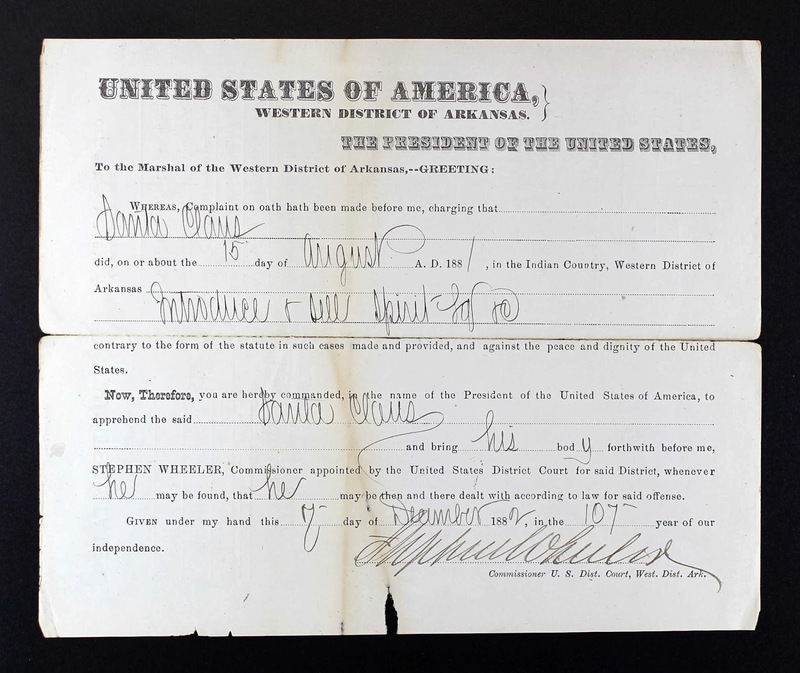 The “mandatory” apprenticeship of indentured servants did not end until about 1840. So where are these records? What more is available? Where would the“Nelson Mandela” family find information on his family history. 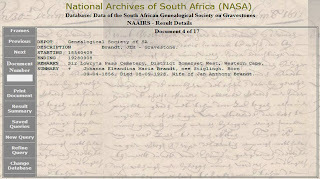 There are resources to searching South African genealogists. Websites (many searchable, or at minimum with a finding aid) can be found to cover every thing from 6) British 1820 Settlers to South Africa to the 7) Jewish South African SIG and database. There's the 8) University College, London database to assist descendants of slave owners trace their ancestors' involvement in the Mauritus, and Cape Colony slave trade. But what about the enslaved? Or indigenous Khoikhoi, as for true history of South Africa? Of course oral family history is essential, but there’s more, at least for Mauritians. Researchers may wish to visit the Nelson Mandela Centre for 9) African Culture Slave Database to learn more of their Mauritian slave history. Others are joining the 10) Cape Coloured DNA Ancestry Project, that began in 2007, tracing their ancestry to the south African slave trade. Where Are My Ancestors Buried? Hart Island, NY. Don’t be fooled by the location name. 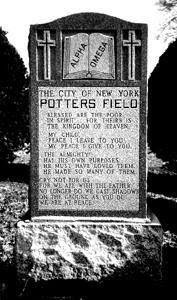 This New York City owned Potter’s Field has a rich history beginning in 1868. Be sure to visit the Searchable Database. In New York, Washington Square Park was once also a potter’s field. 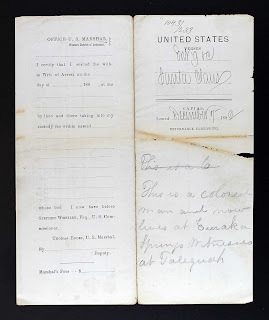 To learn of the earlier New York City Potter’s Field visit the Frequently Asked Questions. Begin with A Local Search. The local Potter’s Field was the answers to not only the burying the poor and unclaimed remains, but also to epidemic deaths, prisoner burials and for those not permitted to be buried on the church grounds. The smallest of towns seem to have a Potter’s Field. Often land was set aside adjacent to a City Cemetery for indigent burials. Such is the case with Hutchison, KS, Eastside Cemetery. Tip: Begin with the last known residence of your ancestor and check the area for Potter’s Field. At a3Genealogy we begin with a 200 mile radius (especially in rural areas), but know our Kansas ancestors have been located in Chicago; and our North Carolina ancestors interred in New York. Learn About the Record Collection. Like many historical collections, Potter’s Field records may not be complete. 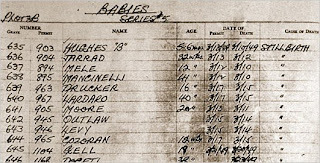 Even the NYC Hart Island records are missing two volumes of infant burial records, spanning 1977 to 1981. 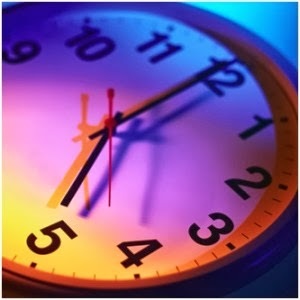 So be sure to understand the shortcomings of the records and collections. In 1911, the Union Cemetery of Kansas City closed their Potter's Field. In May 1911, the new Potter's Field opened at the Municipal Farms and was known as Leeds Cemetery…” “Grave sites were marked with a metal stake that had the name of the deceased written on paper and held under a piece of glass. A few of the stakes can be found, but no names or marked grave sites have survived. All that remains is rough, hilly land covered by trees and scrub. This was known as Section #1 and had burials from 1911-1934. Section # 2 was opened in 1934 and had burials until 1965. This section was on the west side of I-435 while Section #1 was on the east side of I-435. The address for section #2 is 6900 Coalmine Road. It was the area where the police firing range is now located. 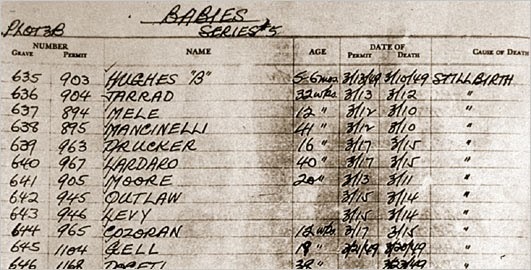 The graves in Section #2 were marked with cement cylinders with numbers on them and each burial was given a number. Some of these remain in place. Research Historical Context: Were Ethnic Burials Allowed? Evergreen Cemetery, the oldest cemetery in Los Angeles, parceled land for indigent burials as early as 1877. This ethnically segregated cemetery held designated sections for Armenians, Japanese, Chinese, early white settlers, and a large section of Mexican graves, and acreage for indigent persons was set aside. Evergreen Cemetery historically allowed African-Americans to be buried at the cemetery also. Ownership of the indigent cemetery passed from the City to the County of Los Angeles in 1917 - 1924. In 1924 Los Angeles chose to cremate the remains of their lost and abandoned and built a crematorium: Boyle Heights. We have located a listings of Boyle Heights burials, void of in-depth genealogical information. The Jewish Cemetery Mt. Zion, Los Angeles, was created as a cemetery for the Jewish indigent between 1916 and 1919. There are over 6800 burials at Mt. Zion. 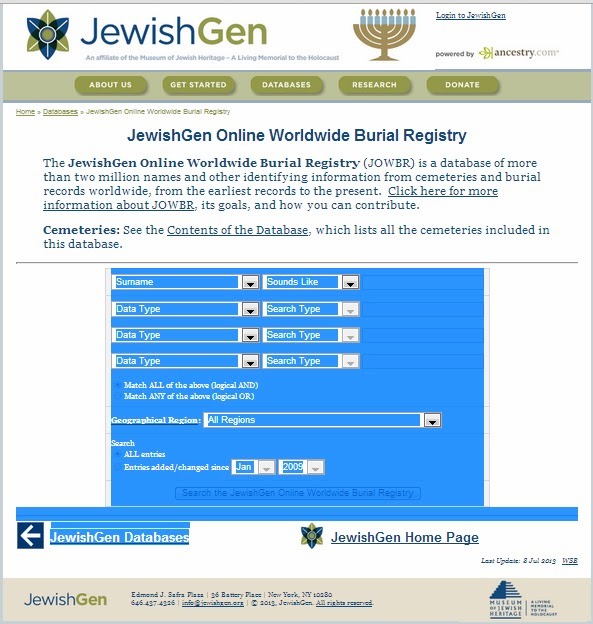 Researchers can find the indexed listings on JewishGen Online Worldwide Burial Registry(JOWBR). The Hebrew name may be provided. With a little digging, may you unearth your ancestor!